Daisen G Citra De Weiss is a 5.5% hefeweizen from Kumezakura Shuzo, based in Tottori, Japan. It’s part of their spring seasonal lineup and can be found in both bottles and on tap. It was first released in 2018, though we’re unsure if it is going to come out again in the future. 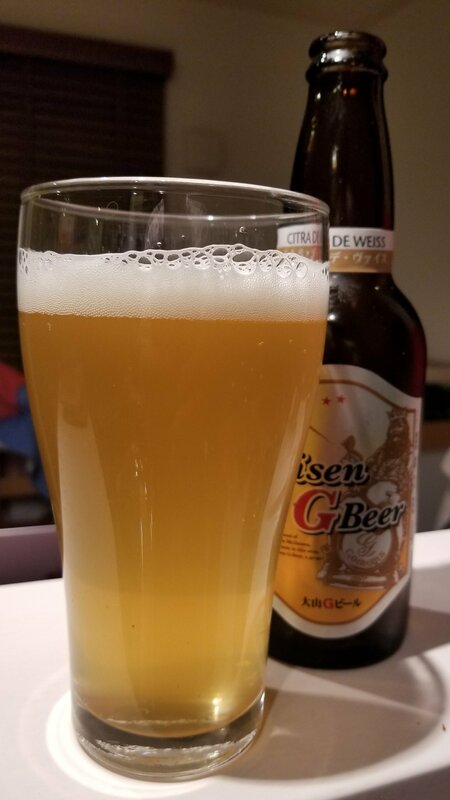 Daisen G Citra De Weiss poured out a hazy light golden colour with a frothy white head on top that collapsed fast on itself, leaving a small ring of bubbles around the outside. It had a strong estery nose to it, with hints of lemon, orange, banana, and wheat coming through too. It was evident that Citra hops had been used, producing an aroma that wouldn’t be out of place on an IPA or American Pale Ale. The body to Daisen G Citra De Weiss was an interesting hybrid of weizen mouthfeel – frothy and light – with IPA bite. A thick lemony body with wheat and orange also present too. The light body made this very drinkable, and would have been perfect in the summer months. It finished off with a lingering bitterness that was not too potent but just enough to let you know it was still there. More of Daisen G Citra De Weiss please! Tighten up the flavours and you’re onto a winner.